Twelve years ago, Tod & I visited Anam Cara for a poetry workshop given by my sister, Jenny Hill, and Jack McGuigan. (My main memory of that trip is memorialised in this poem.) When I realised that we'd be in the area this year for the European Juggling Convention in Millstreet, of course we had to return. But Anam Cara isn't for visitors; it's a writer's and artist's retreat. You have to be working on a project. So Tod & I agreed to create a project sort of celebrating our 25th anniversary coming up later this year. You'll hear more about that when it is done; for now we are keeping it under wraps. 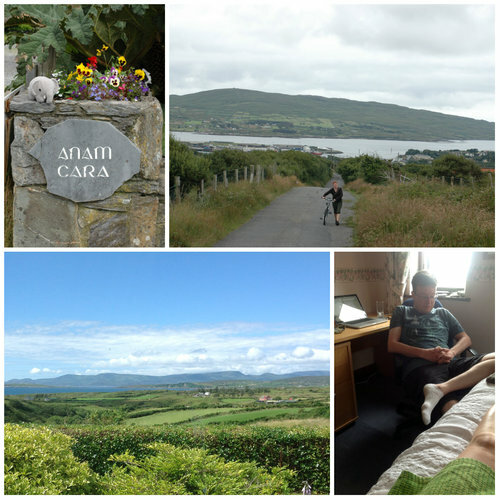 We had only a few days at Anam Cara and we spent them in a mix of creating, communing with the other writers over meals, and exploring the area on foot and bicycle. Unexpectedly, I was invited to do some hooping to help launch a book! Brian O'Sullivan read from his new book, Beara: Dark Legends, at a wine and cheese reception and I greeted people as they arrived with a little hooping and circus-y action set to traditional Irish dance music. It was a lot of fun and made me glad I'd packed a costume. I've wanted to write a book since I was a little girl reading them by the dozen. For years I've skirted around writing fiction. I've been a journalist, a features writer, a tech writer, a playwright, a tutorialist, a blogger - to varying degrees of intensity and success. But writing something book-length eluded me until this month. It was a delightful challenge and I am very proud of myself for having completed a draft within 30 days - 26 days, actually, since I finished a bit earlier than the official deadline. I had some happy surprises and discoveries while I spent the month writing. Memories unlock themselves. My new novel is young adult story set in a high school. While visualising the action in the story, I remembered a lot of lost details from my own high school experience. And used them. Characters come alive. After a couple thousand words, the characters were acting on their own. I only had to watch them and write down what they were doing and saying. This happened to me when I wrote a play, too, so I shouldn't have been too surprised. But I was delighted. Continuity is tricky. I think I have a pretty good ability to hold details in my head, but am sure that there are things I've gotten wrong in my book. Inconsistencies like student council meets on Tuesday, yet I just wrote it was Thursday and here they are in a meeting. Hmmm. And did even Nick run for student council 20,000 words ago? Why is he in this meeting now? Characters fight back. All the times I had "writer's block" it was because the characters didn't want to go in the direction I was trying to send them. Once I spoke out loud to my main character and negotiated a compromise, quickly ended the sticky scene, started a new chapter and writer's block was gone. Coffee is necessary. My Inner Critic can be pretty loud, but if I give him a lot of coffee, he quiets down. Plus coffee makes my fingers go faster. Coffee is good. Characters are unpredictable. Very often the characters did things I didn't anticipate. I'd start out writing a chapter about homework and suddenly someone got suspended. These twists were never planned and always moved the plot forward in interesting ways. I like those surprises. Friends want to read this. At least half a dozen people have asked me if they can read it. That is the scariest part of the process! Though I probably won't publish it in physical form, after some editing, I will make a pretty PDF for you to read on you iPad or Kindle. * The Inner Critic would like to disagree: I am not a Novelist because the novel it isn't finished yet. It is only a draft and even when it is finished it probably isn't worth reading, and even if it is good the chances of it getting published are about .01%. I think I need to give the Inner Critic some coffee now. The kangaroo can jump incredible. He has to jump, because he's edible. But many fine Australians do. Prefer him in tasty kangaroo meringues. Today we went out wandering and ended up at one of our local branch libraries. We borrowed some CDs, a book of children's songs, and a bilingual version of the Japanese constitution with historical commentary. I'm already enjoying the constitution. I am a big fan of the US constitution; I enjoyed studying it when I was in school. If I had taken up law, it would have been constitutional law. I ought not have overlooked the Japanese constitution for so long. It is an equally interesting document. I find myself already thinking "Really? That's not how things seem to work, at least not what I understand from current events" about quite a few points. Perhaps it will all come clear when I get to the Amendments. A foe to rest and peaceful slumber. And sweet what bitter was before. I think old riddles are neat. This is one of my favorites. I wrote a poem using two-word phrases collected from the subject lines of spam I've received recently. They were so inventive, it seemed a pity to just throw them away. I've combined 28 of them into something that makes about as much sense and the spam they came in. (Yellow fleece, Wedgewood blue, winter teal) through her narrow-necked warp. She is wind-worn but never withering at her loom. Needlepoint lace, wire stranding through and through and through. Her non-universalist, world-portioning weave oar-feathers the future. Olive Crown does not want wicked speaking. Parrot mouths a one-seeded message, wonder-mocking the well-alleged tale. World-strange patterns reveal the mock-beggar of truth. 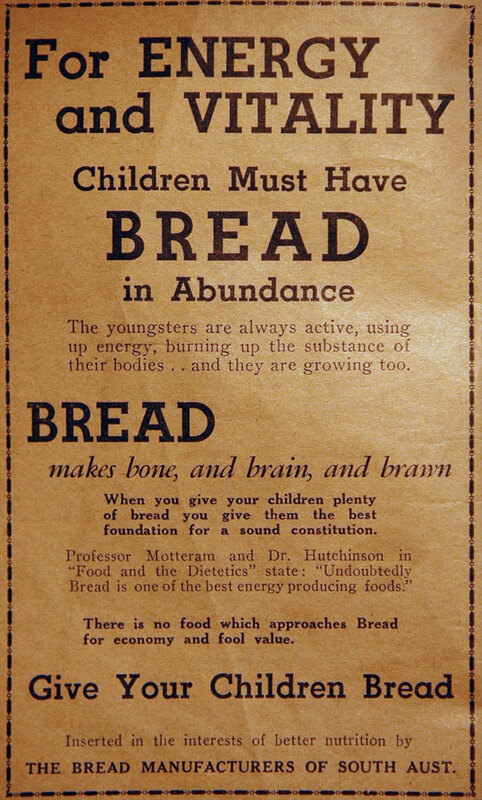 This is a page from a South Australian cookbook, published by Argonout Bookshop circa 1945. MJ's stepfather, Pete, gave it to me when we were in Elliston. It's lost its cover and the pages are wrinkled and acid-burned but the recipes are delightful. Expect to see some of them in upcoming Recipe Thursdays. But what cracks me up is the page opposite this brilliant bread ad. 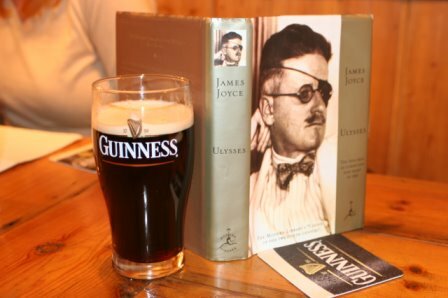 What happens when seven people get together to read a section of Ulysses in a bar in Tokyo? Hilarity ensues. We changed tables twice trying to find a quiet place away from the irritating 80s pop background music but failed. We ordered lots of beer, we rattled the microphone, we (ok, I) tripped over words while reading. But it was such fun that we'll likely do it again. Ulysses "section 4" 43'25" MP3 (40 MB) Read by David, Kasuemin, Susan, Robin, Tod, me, & Jeremy. Syd, our official photographer, noticed a poster on the wall at our table--Learn English in Ireland--with a collage of images including a picture of Joyce and the cover of Ulysses. Providence. If you want to learn more about why we were doing this or if you want to play, too, visit LibriVox and specifically the Ulysses thread in the forums. I had the honor of paging through the only printed copy of my friend Elizabeth's new book this week. It's gorgeous, though she worries it is too heavy. I disagree; the book has a good heft. But better than weight, it has recipes! From fish to desserts, there are fabulous Japanese dishes to cook, a richly illustrated "pantry" section, and lots of tips and kitchen techniques. It really is a marvel. I've eaten with Elizabeth many times and she is a master chef, even when we're just having a casual lunch while computer troubleshooting. 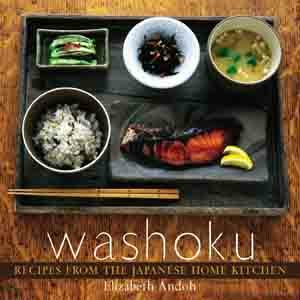 Washoku, Recipes from the Japanese Home Kitchen is due in bookstores next month and available for preorder from Tenspeed Press, and at Amazon. Have a listen and order the book (unless you're on my Christmas list, in which case...surprise! You're getting a cookbook this year!). Elizabeth has a US book tour lined up, so check her calendar at Taste of Culture and see if she's going to be in your area soon. I volunteered with Librivox to read aloud some of the public domain Project Gutenberg texts. I talked about doing this on my own last year, but except for some scattered short stories, never really followed through. Today I recorded the first three chapters of P. G. Wodehouse's Psmith in the City, a 1910 account of two college boys who go to earn a living at a bank--their arch rival is the bank manager, Mr. Bickersdyke (what a mouthful, it took me a few takes to get it right). One of the things that I think will be interesting about this project will be reading books I'd never thought to read before. I read some Wodehous, but not this one.